A meteor hits the earth and a big creature attacks a homeless man in the woods. Okay, Spores. You totally have my attention! Then we meet our cast of kids, heading into the woods for some fun. I don’t know. Personally, even without monsters I’ve never looked to the woods for fun, yet kids just keep doing it in movies. These kids see an old abandoned factory and decide to explore. Again, never saw anything appealing about exploring a death trap. The kids even keep pointing out what a great horror movie setting it is, and they’re so right. It’s extra cool when one guy is filming himself and the creature runs across the screen behind him. As soon as the guy watches the film back and sees it, the craziness begins. 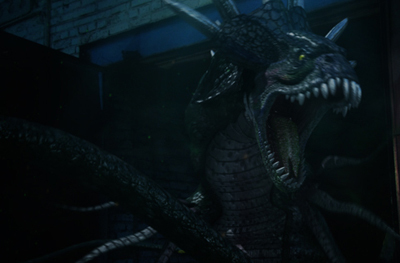 It isn’t long before we get a full-on chase by the creature…which is SyFy Network CGI HORRIBLE. Damn. I was so getting into this Russian creature feature, even though the English dubbing is awful. There’s plenty of suspense and blood as the kids do a lot of running around, even if it is nothing you haven’t seen before. However, after some cops arrive on the scene, the CGI becomes a bit more forgivable, switching from the cheesy four-legged cartoon mutant dogs (that’s what they look like to me) to a variety of crazy creatures. Okay. So the film is a pretty damn entertaining time killer after all, and gave me Stephen King’s The Mist flashbacks by the end. There’s a whole lot going on in Scourge. It begins back in 1871 with a super brief, inexplicable scene that tells us nothing other than that religion will somehow be involved in what goes on during the inevitable jump to modern times. So it’s modern times now. In a small town, we meet a really cute guy and a girl who are so obviously in love but for various reasons, have never admitted it to each other. 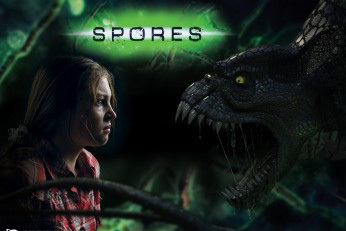 What better way to explore their feelings for each other than to team up to stop an unholy plague in the form of a nasty parasite bug that travels from mouth to bellybutton, giving people serious belching attacks before turning them into zombie-esque monsters that bleed from various orifices? Imagine being locked in a prison cell with this big baldy’s tongue…. Hey. It might sound stupid, but aside from the lame love story, it’s kind of fun and thrilling, with CGI critters and zombie morphing effects that are much better than those in Spores. My favorite part is when the first guy that gets invaded by the plague tries to pass it on to another guy while naked in a locker room shower. Well, that, and this lug in leather. Without a doubt, Scourge has sexier CGI and sexier men than Spores. This entry was posted in The Evil of the Thriller - Everything Horror and tagged creature feature, Scourge, Spores. Bookmark the permalink.